Tech.eu puts the spotlight on Dinube, a Barcelona fintech startup that has evolved from a mobile payments company to a potential competitor to Visa and MasterCard's payment networks. Spanish startup Dinube has created a digital payment network that enables users to pay with their mobile phones in stores. Founder Jonathan Hayes emphasises that Dinube is not your typical mobile wallet (think Google Wallet or Apple Pay) because it does not operate with credit cards and links directly to your bank account. Indeed, the startup has the ambition to become an independent payment system alternative to Visa and MasterCard. At the same time, says Hayes, Dinube is as anonymous as paying by cash: all user information remains secure from the retailer unless he or she opts to reveal it. Dinube has already introduced the system to a big Spanish retailer; now it aims to reach 10,000 users by the end of the year. Jonathan Hayes told Tech.eu why he believes Dinube is revolutionising payment systems, how it cooperates with banks and his vision of the future of mobile payments. Tech.eu: Can you tell us more about Dinube and your vision for the company? Jonathan Hayes: We don’t call ourselves a mobile payment company anymore. We are not the wallet, we are not an app — we are a digital payment network. The story of the mobile payments sector is one with a very high death rate. During recent years we’ve seen the birth of many mobile payment companies. This was everything from Isis Mobile Wallet in the US which later was renamed to Softcard and then shut down. We saw O2 Money in the UK which was launched with a very large budget and then closed down. We saw the US solution called Bling Nation and it also shuttered. We are particularly pleased that we’ve survived during this period with a very ambitious model. Rather then building another wallet, which is a convenient wrapper to Visa or MasterCard, we’ve built a new payment network. We aim to compete with existing payment networks worldwide, which today is essentially a duopoly of Visa and MasterCard, and create a digital alternative to the plastic cards and paper receipts. To do this, you need to build new payment rails – which means a full infrastructure like those that Visa and MasterCard have, but you need to build it on your own and that’s what we’ve done. Instead of a plastic card, we have an application for mobile phones: you link it to your bank account or you can prepay, putting money into that account. Then we have host card emulation on Android, which enables users to tap their phone on the PIN-pad in the store and pay. To make it more convenient, you can use fingerprint or PIN – or both – to confirm the payment. Finally we have integrated with the largest payment gateway in Spain operated by El Corte Inglés which owns about 40 percent of the market in Spain and Portugal. In the meantime we have a large supermarket chain (BonPreu) and a fashion store that already deployed our network; we also have more on the way. How does Dinube’s infrastructure differ from the other existing mobile payment systems? Perhaps the biggest distinguishing feature is that we are actually inside the retailer’s backend point of sale (POS). This is the “Holy Grail” of payments. It is in the retailer’s point of sale where receipts are generated and the loyalty and offers are exchanged. Dinube has built a Software Development Toolkit (SDK) that directly integrates with the point of sales solution. The first integration took us time to develop — it was with NCR, the global leader in retail points of sale. The good news is that now any merchant using that solution can easily implement Dinube. For other POS solutions we also provide APIs (software interfaces) to make integration easy. Because Dinube is integrated with the point of sale and not just in the PIN-pad terminal, we are able to provide full information to the customer. Not just that you paid 45 euros at a supermarket at 11:10am, but we actually know exactly what was purchased. We can show the brand of the product and provide the customer more details. For example, where the product was made, ingredients or calories, etc. Can you use this data somehow? Obviously when you talk about these things you need to meet legal privacy requirements. We decided that that would be the good starting point. We want to be the leader in the way users can handle their privacy. You can make a payment completely anonymously. This is exactly how I pay with cash – so a retailer has no idea who I am. Secondly, we are creating the dashboard where user will have an access to all the information that they can share. In order for this data to be used, the user has to provide specific consent. So we never sell data, it always belongs to consumers, we just help them to manage and protect it. 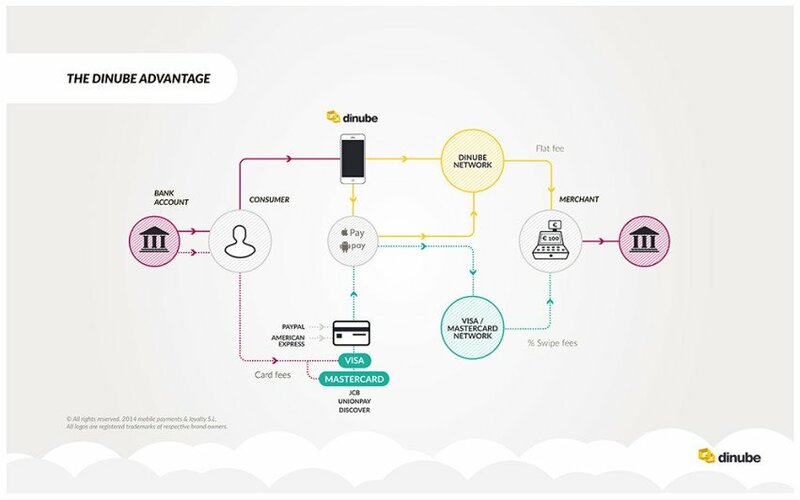 You say that one of the main features is that a Dinube account is connected directly to the bank account whereas usual wallets are linked with a credit card. Do you thus need permission to integrate with the bank system? How do you cooperate with the banks? Dinube is the platform that enables banks and retailers to provide their customers with new high quality services. We divided it into three phases. Step one: today it works as transfer of prepaid amount from your bank account to another account in the same bank. Let’s say you have an account in the bank Santander. When you open up your Dinube account, you select your bank and we give you an IBAN for Dinube, which is also operated by the bank Santander. Then you can make distant payment to that account and the money are available easily, because the transfer is made between two accounts in the same bank. Step number two: we are actively working with a number of large banks to integrate with them. And step number three: the European Directive on payment services which will allow all PSPs (payment service providers) to have third-party access to bank accounts with a new set of parameters, which will be defined next year. It’s a little bit messy in terms of bank integration, but banks are very interested in what we are offering them. Is the amount of money that can be stored on a user’s Dinube account limited? We have three types of user accounts. With a basic account you just sign up with your mobile number. Because we do not have any identification documents it is limited to €1,000 per transaction and €2,500 per year. But if you want to take away these limits, you just need to give us a copy of your ID card or passport and then your limit is €10.000. We also let in ‘pro users’, who are able to spend up to €100.000. How do you plan to engage users? The model is essentially based on multiplying effect between merchants who are promoting this system first of all to their employees. Later on, it will be promoted to the customers that are already enrolled in the loyalty program. And another point: we are working with banks as well, and our vision is that banks will also promote this system to their customers. What is your monetisation strategy? Instead of a commission, Dinube charges merchants a fixed fee of €0.05 per transaction, and a service fee for the digitisation of the retailer’s loyalty program and receipts. It is the primary form of the monetisation. Furthermore, we are discussing with banks to offer new features that existing payment networks do not offer. The idea is that we will have, let’s say, shared revenue with banks on the new services created. Yes, we have seed investors originally from Boston, we also have investors from Silicon Valley and here in Spain we have funding primarily from family offices. So far, we have raised approximately €1.5 million. You position yourself like a first digital payment system of this kind in Europe. Meanwhile this autumn UK app Zapp is also going to launch. Do you see them or anybody else as a competition? Of course it is a competitor in the UK. But we are very pleased that Zapp is emerging. Perhaps at some point in future we can work together on a number of things, but otherwise we can provide our service to banks in continental Europe and also potentially in the USA. VocaLink (the group which Zapp belongs to) only operates in the UK. But it is a good announcement, because it validates that this model has a future. There are three or four other solutions coming to the market this year that are moving totally away from existing legacy players. What can you say about the present state of the NFC payment system in general? Is it something that is going to be widespread in the near future? Mobile payments are a big promise, that now has to be fulfilled. A lot of companies invested a lot of money in this. But I think we are still in the very early days. I am sure it is something that is going to happen, but I don’t think that it will happen as quickly as people originally anticipated two or three years ago. It will become a reality, but it also depends on companies like ours being able to drive these innovative cool solutions for banks and merchants so that they could push the adoption. For us the challenge is to make a front-load in the beginning. It is also about the infrastructure and willingness of big market players to adopt this payment system. Are retailers ready to support it? Merchants are taking up NFC at the point of sale and that is good news. One of the largest Spanish retailers, Mercadona Supermarkets, made a multi-million investment, so that this year all of their stores can already accept contactless payments. Carrefour Spain and El Corte Inglés have also done this. Because of the cost involved, not all retailers are able to switch over all their payment terminals at once and so most of them are doing it progressively over 12-24 months. Data from Ingenico, the leading manufacturer of payment terminals, suggest that contactless adoption in Spain is very high compared to the rest of Europe. Spanish banks have been early drivers of this. What further plans do you have for the next year? Getting larger merchants on board, but also increasing the number of banks that can use our network. I think it is a very positive sign that banks continue to work with existing payment solutions, but also open to the continued creation of new digital possibilities.